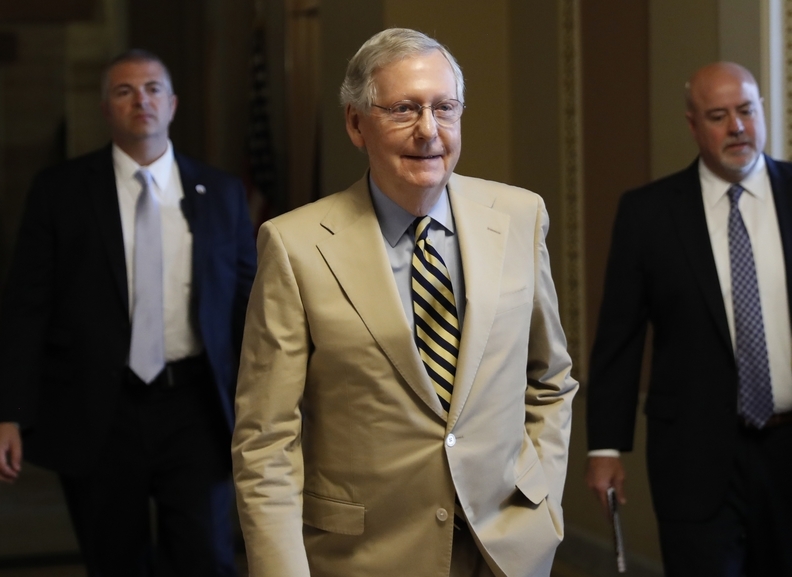 Senate Majority Leader Mitch McConnell of Kentucky walks from his office on Capitol Hill on June 26. Senate Republicans unveiled a revised healthcare bill in hopes of securing support from wavering GOP lawmakers. Senate Republicans' plan to repeal and replace Obamacare will cause 22 million to lose their health coverage by 2026, and 15 million to become uninsured next year, according to a projection from the Congressional Budget Office released Monday. That compares with 23 million losing their coverage by 2026 under House repeal bill. However, not all of those people are insured today. The CBO assumes about 5 million would gain Medicaid coverage if Obamacare stays in force, because more states would choose to cover childless adults. Currently, about 14.6 million gained coverage under Medicaid expansion. That population will continue to receive enhanced federal matches through 2023. Even so, Medicaid will cover 4 million fewer people in 2018 and ultimately 15 million fewer in 2026 under the Senate bill, the CBO said. The bill would reduce Medicaid spending by $160 billion in the last year of the projection, compared with the status quo under the Affordable Care Act. Cumulatively, federal Medicaid spending would drop by $772 billion over the next decade, according to the analysis. "It's the dismantling of Medicaid" that angers Providence St. Joseph Health CEO Dr. Rodney Hochman, whose system includes 50 hospitals across seven states, as well as skilled-nursing homes and home health operations that could be particularly hard hit if the bill passes. With fewer people covered by Medicaid in expansion states, "now we're going to convert some of that Medicaid (reimbursement) into no-pay. Bad debt goes up significantly," he said. Hochman said it will be devastating, even for large systems. The Senate bill would impose a per-capita cap on Medicaid spending tied to the medical component of the inflation index before shifting to standard inflation in 2025. Once that shift occurs, states will not be able to maintain their contribution levels, according to the CBO. States would likely eliminate optional services, restrict enrollment eligibility, increase their Medicaid spending or cut provider and health plan reimbursement payments, the report said. The Senate bill does more to drive down exchange premiums than the House bill did, because the plan that subsidies are tied to is a skimpier Bronze plan, rather than the Silver plan in the current system. That CBO finding could be critical for the bill to pass in the chamber, as Sen. Ted Cruz (R-Texas) has said he didn't think he could vote for the bill unless it did more to lower premiums. The CBO estimated that premiums before subsidies would be 20% higher than under the ACA in 2018, but they would only be 10% higher in 2019 as insurance industry supports begin to take effect. In 2020, premiums would be 30% lower than under current law, but they will be worth less as some states eliminate essential benefits, and the subsidies would be linked to higher-deductible plans. The individual market would change in several ways over the decade, they predict. Once cost-sharing reductions go away, very few people under 200% of the poverty line will buy plans, as deductibles rise too high relative to those customers' income, even with premium subsidies. A single person who earns about $26,500 a year now has an $800 deductible because of cost-sharing reductions paid to insurers. That would climb to $6,000 in 2020 after cost-sharing reductions end and the subsidies are linked to bronze rather than silver plans. Even though an average 40-year-old's monthly premiums would drop from $141 to $133, it wouldn't be a good trade-off. Approximately 7 million fewer people will purchase individual plans, thanks to the high cost of coverage and the elimination of financial penalties for failing to purchase insurance, the CBO said. People who earn less than twice the poverty level and who are 50-64 years old are the most likely to leave, according to the report. With a higher proportion of consumers earning too much for subsidies, the markets will be more vulnerable to adverse selection, the report projects. Nevertheless, the agency expects the system to be sustainable over the next decade. The bill would reduce federal Medicaid spending and support for the individual market by $1 trillion over the decade, and shrink federal revenue by $701 billion; $541 of that loss would stem from tax repeals on high earners, investment income, health insurers and other industry players. The CBO projected the government would have collected $201 million in mandate penalties, mostly from employers. Both employer and individual mandates are eliminated under the Senate GOP bill. Employer coverage will drop by 4 million, the CBO expects. The Better Care Reconciliation Act would reduce net outlays by $321 billion between 2017 and 2026, with about half of that due to shrinking federal Medicaid contributions compared with the rising cost of care. That's $202 billion more in net outlays than under the American Health Care Act. Providence St. Joseph's Hochman said cutting taxes on the top 1% of earners while cutting more than $700 billion in Medicaid spending "is a travesty." In 2018, the rollback of taxes on investments would save wealthy taxpayers $16.7 billion — substantially more than the savings to the health insurers. The bill does increase payments to providers in non-expansion states, both by preserving disproportionate-share hospital payments that were to be phased out under Obamacare and through direct payments. Those two elements combined would send $19 billion to providers in those states. Providence has hospitals in Texas, one of the largest non-expansion states. The bill also dedicates $10 billion for non-expansion states to distribute to providers who see Medicaid patients. "We think it's a drop in the bucket," Hochman said. "Little concessions (to senators) that in the end don't add up to much."